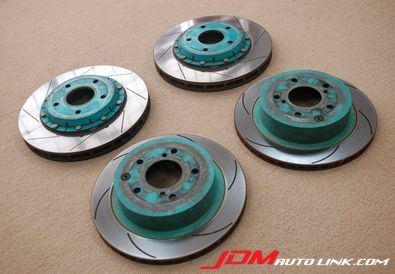 We have a set of Project Mu rotors for the Nissan Skyline R34 GTT (ER34). These are the complete front and rear replacement and will fit right into the car. Purely plug and play. The Project Mu SCR-Pro is a two-piece rotor rated from 0-1000 Degrees Celsius. The SCR-Pro is made from high alloy FC cast iron material and are heat-treated for reliability, durability and thermal stability under aggressive driving. The affixed bell housing is made from billet aluminium alloy for strength as well as reduction of unsprung weight. 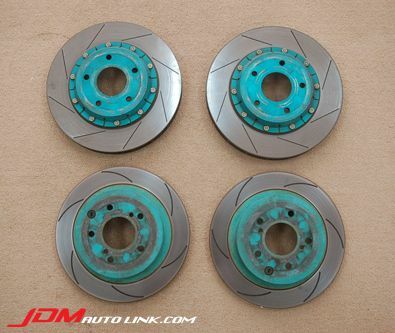 These rotors have 8 slots on its surface to facilitate better pad wear and maximize cooling and braking performance. It also has specially designed internal vane to improve heat dissipation from the rotors. The rotors only weights 6.7kg as opposed to 9kg each of the factory rotors. That's a saving of 4.6kg (2.3kg X 2) of unsprung weight up front! The SCR Pure Plus 6 is made of FC cast iron and are rated at 0-600 Degrees Celsius. These features 6 curved slots to facilitate better pad wear and maximize cooling and braking performance. These rotors weigh in at 6.4kg each as opposed to the factory items at 6.8kg. So for the rear, it will save 0.8kg (0.4kg X 2). Should you be interested in these rotors, contact us at sales@jdmautolink.net for pricing and delivery to your location.